M. Christine Roth, B.A. (Hons. ), LL.B./J.D. (Barrister & Solicitor, Notary Public), has been practicing law for over thirteen years. She is a graduate of Osgoode Hall Law School and heads a full service Law Firm. 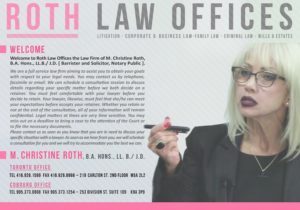 She has had outstanding success with her cases, such as Allegations of Sexual Assault of a Minor, Criminal Harassment, Assault, Theft, Fail to Comply, Fail to Appear, Drinking and Driving (Impaired and/or Over 80) and numerous Domestic Assault cases to name a few. She also has had success in Corporate/Civil Litigation, such as Motions by Plaintiffs to achieve Claims made before the Trial, Security for Cost by Defendants, Claims made by the Banks for Breach of Mortgage, Claims made by the Banks for Pay-Out by the Estate of a Deceased, and many other Civil Litigation matters. She has had numerous successes in Family Law matters regarding Division of Property, Child Access and Custody, Separation and Prenuptials, as well as Divorce and Spousal Support, sometimes representing Husbands/Male partner and sometimes representing Wife/Female partner. She deals with all of her cases, especially Family Law cases, with passion and compassion, keeping in mind that enduring any litigation is tolling on the client. She gets to know the clients on a personal level, understanding all aspects of their lives, needs, motivations, desires, aspirations and difficulties in order to represent the client in a wholesome manner. She has drafted many Wills for clients with all levels and sizes of assets and property. She understands and assists the client to understand that drafting a Will is more than just drafting a Will, as if leaving with a note for after passing. Drafting a Will is planning an Estate regardless of the size. When drafting a Will and planning an Estate, it is important to ensure that after the client has passed, there will be no room for Litigation by the Beneficiaries or others who wish to be Beneficiaries. It is also important to ensure that the Estate will be inherited in a way that if the client does not wish for the Residue to benefit the crown (the Government), this will not happen. She further ensures that there will be no conflict of interest, no duress and that the Executor will be someone that the client trusts fully, as well as planning for substitute Executors, if necessary. She has drafted many such Wills, has planned many such Estates and in many cases she has been and is the Executor and Estate Trustee of the Will. She further is experienced with drafting many Power of Attorneys both for Property and for Personal Care, also colloquially known as Living Will. M. Christine Roth has represented many clients with respect to their Real Estate needs, whether Purchaser or Vendor or Refinancing. She has also written many Opinion Letters for Agreements of Purchase and Sale for clients who wish to consider purchasing a property but require a proper opinion in writing and in detail. She has drafted Agreements of Purchase and Sale and/or has ensured drafting Amendments to the Agreement of Purchase and Sale to the benefit of the Purchaser. 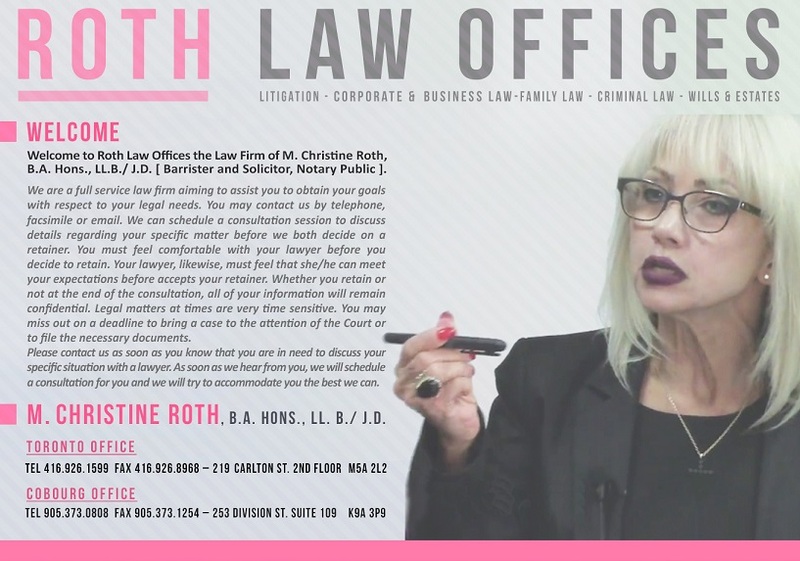 M. Christine Roth has succeeded in many Immigration Law matters and has represented clients with respect to their Refugee Claims or their Appeals or Applications for Stay of Removal, as well as Immigration to Canada under all categories, including Temporary Visas. She has provided advice in all areas of law and has represented clients with respect to their Trade Mark needs, Employment Law needs and Setting-up Businesses to name a few. M. Christine Roth, B.A., LL.B./J.D. 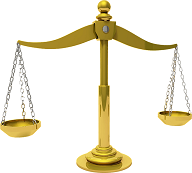 (Barrister & Solicitor, Notary Public), is your lawyer for life. You will be in good hands no matter what your legal needs may be, as all your legal needs can be dealt with under one roof. We can assist you in English, Spanish, and Persian. We are a full service Law Firm. We can provide services with respect to all your legal needs.